Classic. Authentic. Built with Purpose. Southern Tide offers an entire collection built on the highest standards. From the unique sport shirts and casual pants, to the classic sweaters, swimwear and polos, the brand is the leader in youthful Southern style. No matter where one lives, anyone with an appreciation for classic design, good fit and craftsmanship, combined with an affection for the coast and old-world heritage, will quickly fall in love with the charm of the Southern Tide brand. Southern Tide has a beautiful homepage. They added StoryBox to the bottom of their homepage, just above their website footer. Southern Tide chose to use our StoryReel Display Module. This allowed for a compact display of their best customer generated photos and videos. They also enabled our auto-rotate feature - this keeps their content constantly rotating in a way that invites more customer interactions. At the top of the Display Module, they highlight that there are multiple ways for customers to participate. First of all, with #FollowTheTide, customers can share their photos on Instagram, Facebook, YouTube, Tumblr, and Twitter. 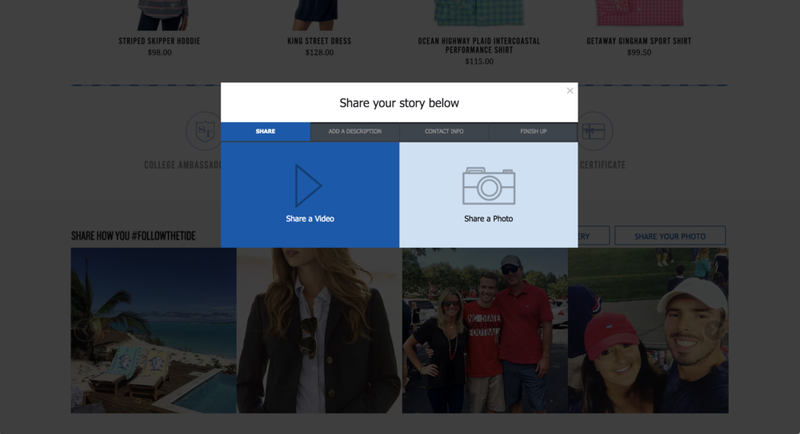 Additionally, if a website visitor clicks on "Share Your Photo" they will be presented with four different options to submit a photo directly on the Southern Tide website, as well as four options to submit a video directly on the website. 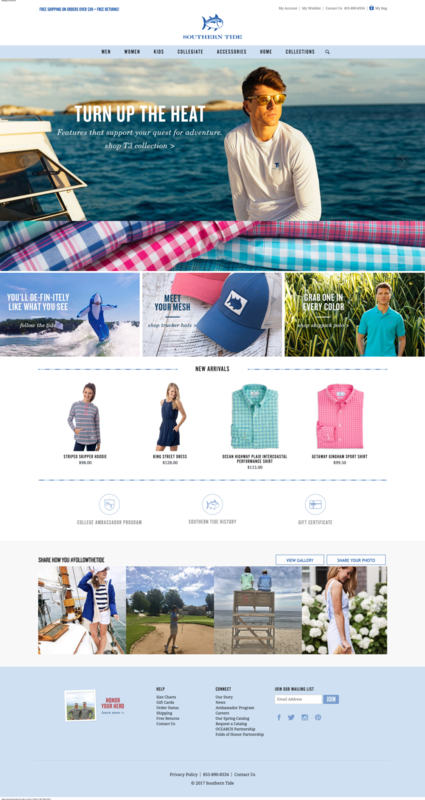 Lastly, Southern Tide let's website visitors know that there is a lot more customer content. By clicking on the "View Gallery" button, customers are directed to the next integration point - Southern Tide's Community Page. 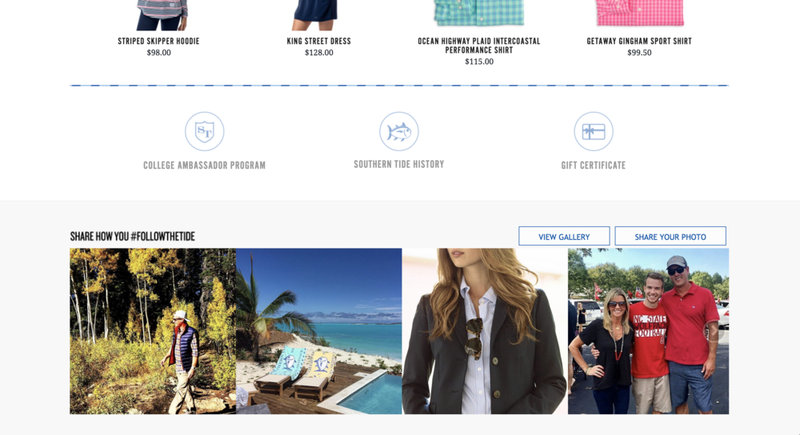 Southern Tide's homepage Display Module also links to a dedicated Community Gallery page. For this, Southern Tide created a new page on their website. They uploaded a compelling header image, as well as some very succinct text ("Show us how you #followthetide"). The rest of the page is one line of embed code from StoryBox. Southern Tide chose to use our StoryFall Display Module. They also enabled an "Endless Load" option. This means that as a website visitor scrolls down the page, our Display Module will continuously load more content (just like on Instagram). Clicking on any image opens a lightbox where customers can not only see the customer's photo or video, but they can also purchase the items shown in the customer's photo. To participate, customers can use #FollowTheTide on any social network. In the top left, there is also a "Share Your Photo" box, allowing website photo & video submissions. As a tribute to military veterans, Southern Tide launched an Honor Your Hero campaign. Supporting Folds of Honor, Southern Tide invited their community to share photos using #southerntide and #freedomrocks. The resulting gallery is incredible and inspiring. It features family members, loved ones, friends, spouses, and other brave men and women who are defending their country. Southern Tide promoted this campaign in their website footer, on social channels, and in emails.